Summary: “The queen has returned. Everyone Celaena Sardothien loves has been taken from her. 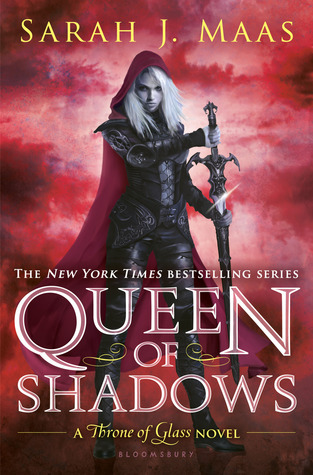 But she’s at last returned to the empire—for vengeance, to rescue her once-glorious kingdom, and to confront the shadows of her past…She has embraced her identity as Aelin Galathynius, Queen of Terrasen. But before she can reclaim her throne, she must fight. She will fight for her cousin, a warrior prepared to die for her. She will fight for her friend, a young man trapped in an unspeakable prison. And she will fight for her people, enslaved to a brutal king and awaiting their lost queen’s triumphant return. The fourth volume in the New York Times bestselling series continues Celaena’s epic journey and builds to a passionate, agonizing crescendo that might just shatter her world.” (Summary found on Goodreads). The ending of Queen of Shadows was amazing. I couldn’t put down the second half of the book. It’s the first half of the book that I had a problem with. The first half was fairly boring and the plot was moving at the speed of a snail. Though, once the pace picked up, the pace picked up. I’m still in awe at Sarah J. Maas’s world-building, character building, and every single word she writes. Aelin (formerly known as Celaena) has to be one of the best female characters existing in young adult literature. She doesn’t let anything stop her from her goal, she’s beyond confident, she may be strong, but she hurts like everyone else, and she’s so powerful. Not to mention, she will also put anyone in their place if they do her wrong. I also love Chaol and Dorian SO MUCH. However, I’m not all that fond of Rowan. Along with Queen of Shadows being fairly boring in the beginning, I have another issue: the next book doesn’t come out until around September of this year. That’s a long time. I highly recommend this series, even though I’ve only rated one book five stars. Once you get past the boring parts, this series really is great. Frankenstein Review! A Classic I liked! Book Hugger on Mid-Year Book Freakout Tag! © 2019 Book Hugger Reviews. All Rights Reserved.